This construction, located at 9, rue Auguste Blanqui in Saint Denis, has nothing to do with crossbow shooting! Built in the early nineteenth century, this large building is the vestiges of the Manufacture of printed canvas created in 1772 by the Swiss man Rodolphe Ebinger. The first cotton fabrics, painted or printed, were manufactured in Asian India, hence the name “Indian”. Indian production began for the first time in France in the early eighteenth century. Initially, they used new manufacturing facilities to make dressing gowns which were also called “Indian dresses”. First hand-painted, the printing of fabrics was then done with wax and after that with stencils. These cheap printed cotton fabrics were generally favorably accepted in France and the use of Indian gowns extended to the use of furniture. With the opening by Oberkampf in 1760, of the Jouy factory (Manufacture de Jouy), the fabrication of printed cloth settled permanently in France. 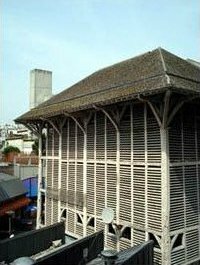 The House called « house of rafters » in Saint-Denis is the building in which the final phase of the manufacturing of the “Indian” fabric was carried out : the drying process. It had the characteristic structure of drying racks, designed for drying long pieces of cotton, hence its height and clerestory shutters. Why is this former factory called “House of rafters”? It owes its name to the spectacular architecture of its roof. In terms of structure, the rafters are pieces of oblique wood protruding outwards and form the boundary of the roof-panel. Find more information about industrial heritage in Seine-Saint-Denis.